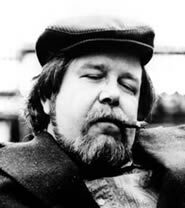 From a crackling whisper to a moody moan to a raucous shout, Dave Van Ronk's voice has been bathed in as much critic's ink as whiskey. And today, after more than thirty-five years of playing clubs, festivals, and concerts, he is doing the best work of his career, as his recent Grammy nomination confirms. Van Ronk is easily one of the most influential singer-guitarists to come out of the percolating Greenwich Village music scene. In keeping with its support of folk-roots music, the Night Eagle Cafe is proud to welcome the famous "grizzly voiced finger-picker" in two Sunday shows, at 3:30 and 7:30. He will be accompanied by dobro master David Hamburger. The 1959 Folkways release Ballads, Blues and a Spiritual was the first of some twenty recordings that show a continually evolving sound. Defying pigeon- holing, Van Ronk in fact credits his longevity to his versatility and willingness to journey, guitar in hand, through musical genres. From the Greenwich Village folk boom of the 1960s where he got his start, to the Tom Waits and Paul Simon tunes found on his latest album To All My Friends in Far- Flung Places, through ragtime guitar arrangements of Jelly Roll Morton and his own insightful and often hilarious songwriting, the preeminent performer didn't forego a short stint performing rock, and on-again-off-again affairs with jug band music and the cabaret theater tradition of Bertolt Brecht and Kurt Weill. Folklore adds, "More than almost any performer in the folk revival, Van Ronk makes the distinction between 'traditionalists' and 'singer- songwriters' superfluous. Even when he plays an older arrangement...Van Ronk never sounds like anyone but himself." Van Ronk appeared at the Newport Folk Festival and was an insider in the scene that gave rise to Bob Dylan, Joni Mitchell and Peter, Paul and Mary. But he made his reputation as an urban blues singer. Originally from Brooklyn, the then merchant seaman was encouraged to play professionally by Odetta. He still can't leave the blues behind for long. Fingerpicking his way through the years, his own wry compositions like "The Garden State Romp" and his poignant renditions of established works like Billie Holliday's "God Bless the Child" have bridged the gap between urban white and African-American musical sensibilities. "Van Ronk is one of the most influential musicians to come out of the American folk revival, his handiwork apparent in the work of hundreds of artists who are unaware of their musical parentage. His guitar playing, building on the work of earlier players like Furry Lewis and Josh White, taught us all how to frame a vocal line with elegant simplicity. His gruffly tender singing style brought new phrasing to the folk and blues idioms, adapting skills he had learned as a traditional jazz singer, and proved that urban folk singers did not have to ape rural mannerisms to sound sincere and authentic," says SingOut! His creative adaptation led to the repertoire of over 300 songs and the international reputation that have kept him in the fond public eye for a generation. Van Ronk explains best why he remains an ambassador for both contemporary and traditional music: "Each generation stands on the shoulders of the preceding one. John Hurt, Gary Davis, Woody Guthrie and Robert Johnson are the old masters. We study the masters like a painter studies Giotto. You don't stay there, though, you evolve. I've heard young performers in places like Bozeman, Montana, that you wouldn't believe. Folk music and the blues are not surviving, they're flourishing. My next project is to infiltrate the Continent."